The nights are drawing in and Christmas is nearly here. Last week we had a fantastic display of our Christmas products, some of them old favorites and some great new lines. Our new Chocolate and Orange bread went down really well, a sour dough loaf that goes through 4 fermentation processes with cocoa, chocolate chips, candid orange and honey. We served it with some Stilton and some of our Apple, Cranberry and Cinnamon Chutney, wow, what a delight. Christmas wouldn’t be Christmas without some classic Italian Panettone. Our individual Panettone tastes great and comes in a beautiful presentation box – if you have any left after Christmas, it makes the best bread and butter pudding. Our mini mince pies are still the best mince pies we have ever tasted – a bold claim, but one that we would happily challenge anybody with. This year, the mince pies are nicely paired with a beautiful shortbread and mincemeat tray bake. It’s kind of like a mince pie as a tray bake – a combination of buttery shortbread with a rich layer of fruit. 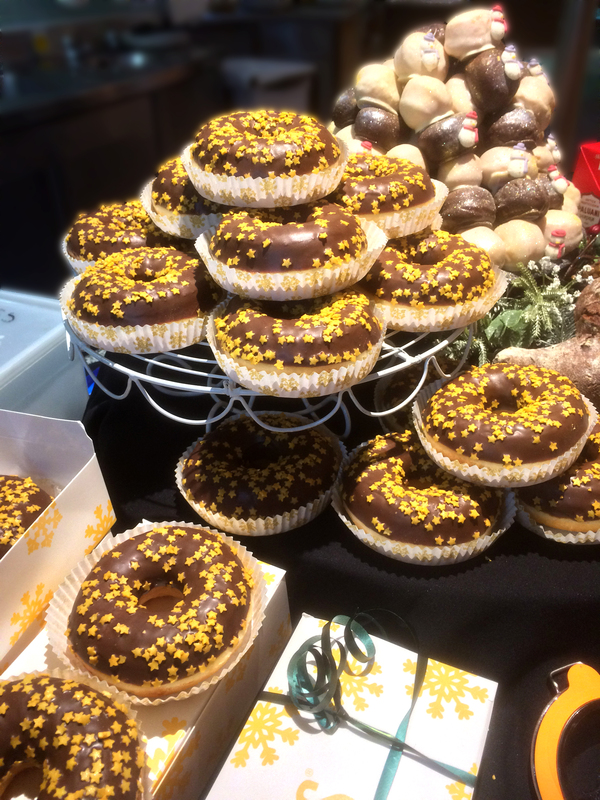 Our Dots Christmas Doughnuts is supplied with around 10 twin take-away boxes that make a perfect little take home gift or afternoon treat for two at your desk. Also, our little white and dark PopDots make a great twist on the classic croquembouche – it looks great sprayed with some gold and silver edible spray and a few other Christmas decorations. Don’t forget the Christmas puddings, we have three types of pudding to choose from. Our Ultimate Christmas pudding recipe has been unchanged for 30 years and is full of rich fruit and nuts – a celebration of the summers bounty during the cold of mid winter. Each one is supplied as an individual 120g pudding. We also have a 90g individual pudding that has been made without nuts and slightly less fruit along with a 1kg loaf version that is perfect for slicing. Along with all these lovely items, we are also able to provide you with the best quality prepared fruit and vegetables, hand-made terrines, some stunning cheeses and great quality patisserie items.